Bands FC. Photo: The Mancunion. Bands FC are something a little bit different. Combining elements of football club badges with musicians’ logos, what started as a fun Twitter-based venture has now been featured in The Guardian, NME, and BBC North West Tonight. Their exhibitions have traversed the globe, with the show currently in Nottingham, but has visited New York City, Halifax, and Salford Lads’ Club, made famous by The Smiths’ iconic photo shoot. I spoke to Nick Fraser, co-creator of the project to learn more about how Bands FC started, and where he thinks it all fits into what has truly been a renaissance year for football in the UK. I was keen to see where Nick gets the inspiration for the crests, even after the end of England’s heatwave-and-pint-throwing-fuelled World Cup run. He rightly points out that all of the crests have a football root — “if you take, for example, the font that’s used. Bands tend to go for crazy fonts, think of Iron Maiden for example, whereas football teams go for fonts that you might think of as ‘boring’. Trying to marry the two — the identity of the band’s crazy font and the identity of the club — is the “trick” in Nick’s eyes. “Some of them aren’t so tricky. Death Cab For Cutie — the initials of Death Cab For Cutie are DCFC, that’s Derby County Football Club! Twitter has been a huge help for the duo. As mentioned before, Nick didn’t think Bands FC would go beyond a few images posted online, but now the account has a 45,000-strong following. It’s a unique insight behind the project, with sketches, news, and exclusive merchandise all being released through their account. There’s a real feel online that Bands FC is exactly that — a club for music and football fans alike to come together to celebrate their mutual loves through design. Most love it, but some unfortunately miss the point. “People have said ‘The Cure? Nottingham Forest? The Cure are from Crawley!’ and it’s like wow! We used Nottingham Forest for The Cure because they did a song called ‘A Forest’, and that’s what a picture on the badge. “It has to engage us”, Nick adds. He’s right, too. There’s a soul in Bands FC which is arguably missing from the vast majority of football today, and that soul comes from the passion, creativity, and joie de vivre of the team behind it. That joy of life is important to Nick. Bands FC is serious about raising funds for charity, but he also recognises that it’s a bit of fun, too. “The frequently asked question is ‘what if the team I love is not a band I love?’ The answer is simply ‘remember that you’re actually a grown-up’. Bands FC are part of two larger movements, in some ways. The first is that they’ve has raised thousands for charities. 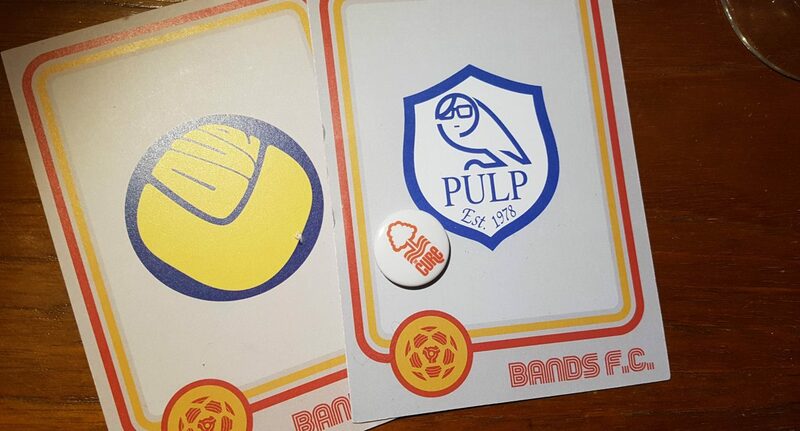 Their Pulp-Sheffield Wednesday shirt was created on the permission of Pulp to raise money for Sheffield’s Children Hospital, and Jarvis Cocker was one of the customers. Nick and the rest of the team often make merchandise only with the blessing of the band in question, and for charity. “A lot of Manic Street Preachers fans asked us to make the enamel badges, and we said ‘we do so with the say-so of the band, and then find a charity’. Their second larger movement is football based. After years of commercialism, football is being hit by the DIY wave that started in punk-rock some years ago. Fanzines are now the rise, as is football-influenced fashion. “Yeah I think so [too], social media’s helped that. One thing people say is ‘why has no-one done this before?’ Try doing this in 1987! Where would you do it? Put posters up? Bands FC is across more than one board, too. It’s not just about boys and girls, or football and music. It’s a representation of the good of social media, bringing people together over something they genuinely love. The exhibitions and charity fundraisers are more than that, too. What started as a way for bands to get a look in during the 2018 World Cup is now a home for the musical, a home for the charitable, a home for the football fan, a home for the DIY-enthusiast. If you’d like to view Bands FC, you can check them out on their website, or Twitter. All the crests are free to view online, and they’ll next be in the North West from 7th-13 January at the British Music Experience in Liverpool. Go along, and you’ll join the club.